Believe it or not, most of the bankers are used to occasional bank strikes in India. But does it actually help to achieve our goals? That is highly uncertain and ambiguous. If bankers are still getting their pay revisions or other negotiations after a prolonged delay, what exactly is the use of strike? 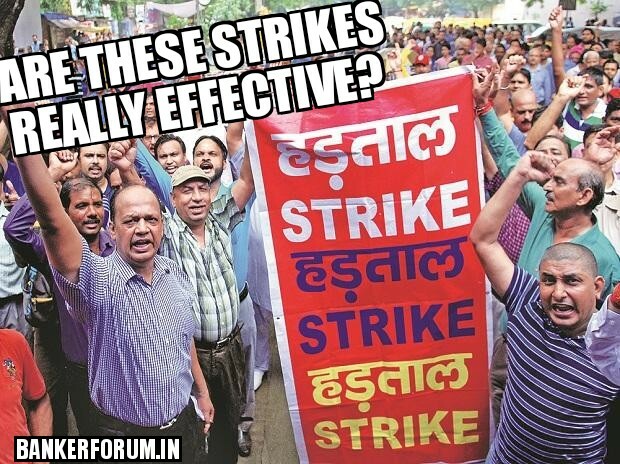 Isn’t a strike supposed to be an extreme step taken by any group? Yes it is! Then why are we made to go on strike, that too on a No Work, No Pay basis? Understandably, one of the main reason most of the bankers resort to strike is that it gives a short leave from work, although with a penalty of pay-cut. It appears as if there is little impact of the strikes done by bankers. The only way it might create news is by the measure of discomfort that is faced by the public. And for this too, bankers are blamed as unwilling to work. Government has now responded to this by declaring banking as Essential Service, further putting restrictions on the bankers to voice their. To the management, strikes might be a good way to cut some expenses. Targets are already being taken care of in advance by the pressure created by the management itself. So ultimately, it turns out to be a win win situation to the management. To the ‘Union Leaders’, strikes are the best way to demonstrate that they care. Strikes give them a great opportunity to make negotiations with the management as well as the common bankers in such a way that their own interest is served. Not to say that we should not do anything, we must also understand the fact that strikes should be a last resort to achieve our goals. And if no results are being achieved by strikes, then there is no point in having strikes at all. Such protests are common among many government departments and industrial units, wherein aggrieved employees put up black bands as a mark of protest or dissatisfaction. This kind of protest ensures that services are not compromised in any way by a message is passed that something is wrong. This would be a fun-to-do thing. Every banker knows that if things were done exactly as per the guidelines (rules) no work would be possible. This method of protest follows this rule only. As a mark of protest, an employee does exactly what is written in the rulebook. And anything that moves away from the rules/guidelines becomes a clear No! And since you are following the rules, your superiors are unable to count you accountable. One of the common beliefs in the market about the public sector banks is that the bankers are lazy at work. And this method of protest catches this point to be true. Since there are no written rules of doing a particular work in a measurable time duration, another firm of protest is by cutting half your productivity at a mass level, thereby causing unrest in general. Banking is a service industry. Most of customers visit branches regularly due to the personal relationship with the staff. Under this form of protest, bankers come to office, do their daily jobs without any personal concern, and go back, thus creating a mechanized model of banking. Such a model would create an uneasiness among the customers which is soon escalated upwards. Every banker is familiar with these extreme forms of protests. The latest example of such uprising was during the We banker protests that created a new movement among bankers. There might be countless others ways of showing your dissatisfaction with the existing conditions, but the point is that if something is not effective in bringing the result then it needs to be changed. If we are unable to bring change through strikes, there seems to be a serious need of rethinking about the ways the voice of bankers should be raised.